I’m reasonably familiar with comics. I grew up reading old Marvel issues and in recent years I’ve been diving more into the literary side of graphic narrative. Superhero comics are well and good, but the genre has a lot more to offer than that. I’ve recently been rereading Sandman by Neil Gaiman, a series I read over the summer and fell in love with. 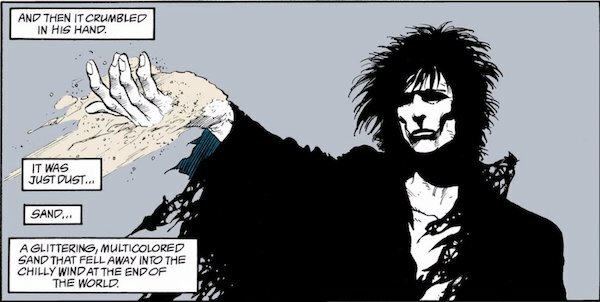 Neil Gaiman is one of my favorite authors and the characters, bizarre situations and heady overtones keep me wanting to read Sandman even though I’ve finished it. Gaiman, Neil. Sandman Vol 8: At World’s End. DC, Image Comics 1994. Dream in the Desert. Sandman is a strange story that plays with the comic formula in a lot of interesting ways. Scott McCloud talks about the gutter, the space between two panels on a comic page. This space is a place for the reader to imagine a transition – motion in a conversation, action in an action scene etc. The gutter gets really interesting when the artist manipulates it in some way. I read a Moon Knight comic where often times the gutter is the part of the characters costume: His white cape providing the breaks between panels. Sandman is similar to this, but in a more direct way. The protagonist of the story, Morpheus, the titular Sandman is a living embodiment of dreams. It’s essentially his job to make dreams and make sure they’re serving their proper purpose. The story goes to a bunch of strange places with this, with plot lines focusing on the strange and abstract. This is also reflected in how the art is drawn, Morpheus in particular. He’s always drawn in black clothes with pale, PALE skin. Oftentimes he will bleed in and out of the gutter, Gaiman’s way of showing how Morpheus bleeds from dream to dream. The gutter is really interesting, genre specific tool and it’s fascinating to see someone as prolific as Gaiman work with it. I didn’t realize until I wrote this post that the front page blurb for Understanding Comics was by Gaiman himself. A funny coincidence, but it’d definitely be something that’d make Morpheus chuckle.